The following questions and answers have been especially formulated with the newcomer to Buddhism in mind. Q: Who was the Buddha? A: The Buddha was a man who lived some 2,600 years ago and who revolutionised religious thought in India. This way of thought spread throughout the Eastern world and has now found its way to the West. Q: What does the word 'Buddha' mean? A: The word 'Buddha' stands for the Awakened State (literally it means awakened), so it is used in relation to waking up to truth, to becoming enlightened. Q: What did the Buddha teach? A: His teaching was extensive. 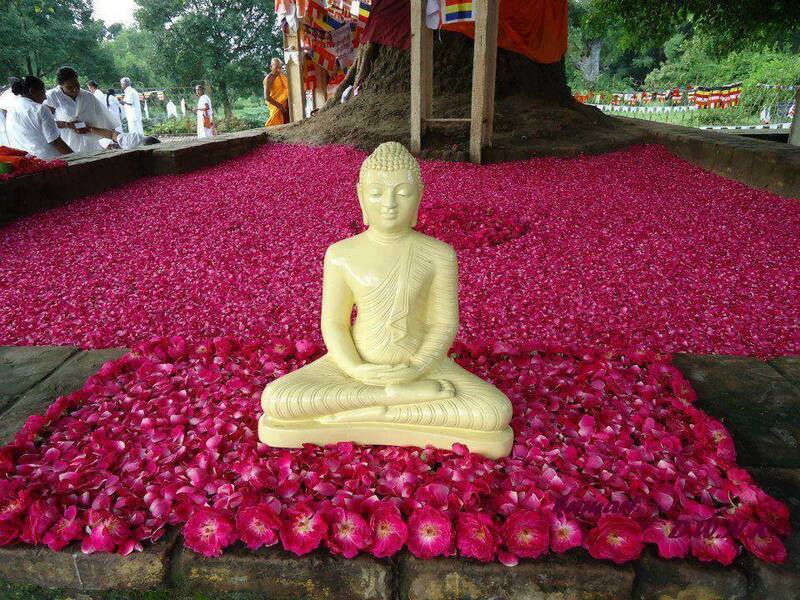 However, it is commonly agreed among all traditions throughout the Buddhist world, that fundamentally the teaching of the Buddha is contained in just four truths - the Four Noble Truths. Q: What are these truths? A: They are: the truth of suffering; the truth of regarding the cause of suffering; the truth regarding the cessation of suffering; and the path, the way leading to the cessation of that suffering. We suffer when life does not go our way, when our hopes are dashed, and when disappointment or tragedy strikes. We also suffered when life does go our way. Why? Becausewe fear loss - loss of pleasure, wealth, family or friends. This is the truth of suffering. Wishing, wanting, and desiring are the cause of suffering. We produce our own suffering by the way we think and act. Because we produce our own suffering, it is within our power not to produce it, and not to suffer. This is the truth regarding the cessation of suffering. The way of life which does not cause suffering is the path; it is the way of harmlessness, wishlessness, selflessness. Q: Is there a God in Buddhism as in Christianity? A: It is very difficult to compare Buddhism with Christianity. One would have to say, however, there is no God in Buddhism in the way that God in Christianity is commonly understood. Q: What do Buddhists believe? A: Different Buddhists believe different things, but the nature of belief is itself an important issue in Buddhism. Belief is to be seen as belief, not as fact. When we see our beliefs as facts, then we are deluding ourselves. When we see our beliefs as beliefs, then we are not. Seeing things in their true light is the most important thing in Buddhism. Deluding ourselves is the cause of much suffering. So Buddhists try to see beliefs as beliefs. They may still believe in certain things - that is their prerogative - but they do not cling to those beliefs; they do not mind or worry about whether their beliefs are true or not, nor do they try to prove that which they know cannot be proved. Ideally though, a Buddhist does not indulge in any kind of belief. Q: Does Buddhism teach reincarnation? A: Reincarnation is not a teaching of the Buddha. In Buddhism the teaching is of rebirth, not of reincarnation. Q: What is the difference between reincarnation and rebirth? A: The reincarnation idea is to believe in a soul or a being, separate from the body. At the death of the physical body, this soul is said to move into another state and then enter a womb to be born again. Rebirth is different and can be explained in this way. Take away the notion of a soul or a being living inside the body; take away all ideas of self existing either inside or outside the body. Also take away notions of past, present and future; in fact take away all notions of time. Now, without reference to time and self, there can be no before or after, no beginning or ending, no birth or death, no coming or going. Yet there is life! Rebirth is the experience of life in the moment, without birth, without death; it is the experience of life which is neither eternal nor subject to annihilation. Q: Does that mean there is no such thing as birth and death? A: That which is born, dies. Forms come and go. All that comes into existence is impermanent; it is born and it dies. But the very essence of what "I" am -- the Buddha-nature -- is unborn and undying. Q: Is this just a Buddhist belief? A: Buddhists are people and people do believe things, but Buddhism is concerned with truth, not with belief, and the teaching is to see things as they are. If we believe anything which has not been experienced, we should know what we are doing. When we do not understand something, then to maintain an open mind is the healthiest and wisest practice. Q: But what happens when we die? A: If we understand what the word "I" really represents, we can realise the answer to this question. Buddhism does not offer intellectual answers; it only gives directions for the experiencing of truth. Q: How is it possible to experience truth? A: By understanding that "I" and birth and death are notions, concepts, ideas, beliefs. It is the idea of a self living life through time, which produces the idea of birth and death. We have been conditioned into believing that we have come into existence and in due course will cease to exist. If we see through these ideas and realise that this moment neither begins nor ends, we shall realise deathlessness. Q: But how can getting rid of ideas enables us to see deathlessness? A: The deathless is here all the while, but ideas block it out. It is like the sun because of the clouds. But as soon as the clouds are cleared away, there is the sun. Likewise, as soon as ideas are cleared away from the mind, there is the true state of birthlessness and deathlessness. Q: How does one clear away ideas? A: By seeing ideas as ideas and not as truths; by being aware of mental formations through meditation. Q: Are there various kinds of Buddhist meditation? A: There are different exercises taught by teachers of different Buddhist traditions and schools. The main differences, however, are superficial ones, related to psychological or emotional problems. Many of these exercises can only be administered by experienced meditation teachers. For the average person, however, whose sole aim is to realise the deep clear teachings of the Buddha, meditation is a simple process of awareness and investigation. Q: How does one practise this kind of meditation? A: By being fully aware, as one thinks, speaks and acts. Q: But what about sitting meditation? A: Sitting meditation is the same. It is just a question of being aware. Sitting meditation is an excellent thing to do, but some people are not able to find a quiet spot to sit in every day. If this is the case, one is not automatically debarred from the insights of meditation. To meditate properly is to do one's duty and to live without wishing life were different, or somehow better. The opportunity for seeing truth is ever present, because truth is ever present. Just because the sun is covered by clouds does not mean the sun is not there. Conditions are always just right for being aware of the true situation. All one has to do is be conscious of what is taking place within one and around one, without making any judgements. If we "see" by being aware, then we shall see very deeply into everything. Q: How does one practise sitting meditation? A: Sitting meditation is the shutting down of all sense stimuli in order to realise that awareness is not a function of the senses or of the thinking process. It is practised by sitting quite still with the eyes closed (or not focusing on anything), by letting life be, by breathing in and out (not changing the breath, not trying to breath deeply), by just breathing the way one always breathes, and by noticing the subtle changes in the mind and in the body. It is neither difficult nor complicated. Q: Does one need to have a meditation teacher? A: The Buddha's teaching can be the teacher and awareness can be the practice which will lead straight to liberation. A: It is cause and effect. When someone commits a crime, he suffers the consequences. That is karma. When someone does good, he enjoys the consequences. That is karma. But karma runs deep; its affects our hearts and minds. From the beginning, mind is absolutely pure. If we are unkind, deceitful, greedy or cruel, we defile that purity. Imagine a plain white cloth, beautiful, bright and clean. And then imagine someone splattering it with black ink. The cloth is then spoilt. The mind is like the white cloth. Like and dislike, greed and hatred, are like the ink splattered across it. When the mind is unmarked and unspoilt, suffering and enjoyment do not exist. This is happiness beyond pleasure, beyond karma. All karma is impermanent and runs out in due course. A Buddhist will learn how to get off the karmic see-saw of pleasure and pain. Q: Can anyone see the Truth? A: The Buddha was compassionate. He did not teach an impossible teaching that ordinary people could not understand. On the contrary, his teaching was clear and simple. Anyone who makes the effort to be aware will realise his or her Buddha-nature and be freed from suffering.